The biodiesel industry came together in January to engage, innovate and grow during the National Biodiesel Conference & Expo. The national event of the year lifted off Jan. 22 in San Diego with inspirational remarks from industry leadership. 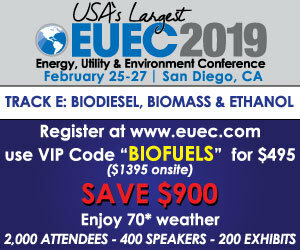 Attendees at the National Biodiesel Conference in San Diego got a glimpse into the future Jan. 22 as equipment manufacturers, industry experts and fleets detailed why diesel engines will continue to be a mainstay for many years to come. On Jan. 16, a U.S. Senate committee held a hearing on the nomination of Andrew Wheeler to serve as EPA administrator after serving as acting administrator since Scott Pruitt stepped down. He discussed the government shutdown and possible delays. Following China’s ban on U.S. soybeans, the U.S. has been in need of new buyers. The EU-28 benefits from this situation as its imports of U.S. soybeans have multiplied. Three-quarters of EU soybean imports are now coming from the U.S.
Gov. Kim Reynolds released her 2019 Iowa budget proposal Jan. 15. Included in her budget was $3 million for the Iowa Renewable Fuels Infrastructure Program, which provides cost-share grants to help Iowa retailers offer higher blends of biofuels. The upgrades at the Kakinada plant included installation of a pretreatment unit to process waste oils; expansion of boiler and other utility capacities; and implementation of environmental systems to enable full production of 50 MMgy of biodiesel. The U.S. Energy Information Administration is seeking public comments on several changes it intends to make within its Petroleum Supply Reporting System, including those related to data collection on biofuels. Comments are due Feb. 25. A coalition of international business aviation organizations joined Los Angeles civic leaders to mark a milestone in the development and adoption of sustainable alternative jet fuels through Business Jets Fuel Green: A Step Toward Sustainability.